Thurl Ravenscroft. Now that's one hell of a name. He was the voice of Tony the Tiger. They're grrrrrreat! And now, Tony has been silenced. Normally, I'd make some snarky comment here, riffing on "they're great" (and I have one in mind, of course), but I'll let it pass. Adios, Tony. See you on the other side. I felt very sad when I heard of his passing this morning. I was glad to see someone else noticed. 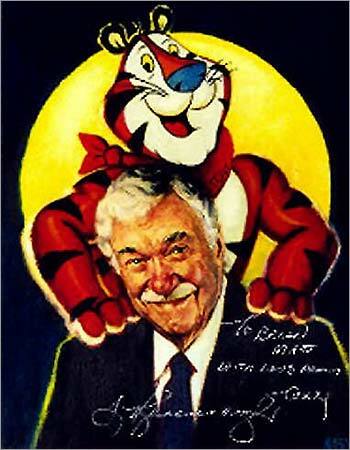 He had been the voice of "Tony The Tiger" my whole life... One of the real bummers of getting older is living to see all these small icons of culture pass away. Middle Age - Yeah! IT'S GREAT!